Last year, I spotted a white coffee table set which I couldn’t buy on that particular day. Went back the next week and it was gone, gone forever. I then started seeing them pop up on everyone’s Instagram feeds! The new Spring Home Collection is bang on trend at bargain prices. There’s beautiful marble tables (which I love), soft cushions, picture frames, lamps (these are on my list to buy) and more as part of this collection. You can pre-order your favourites online from 11th February and buy in stores on the 15th February. I’ve rounded up some of my favourites from the collection below. What are your favourites? Let me know in the comments below! 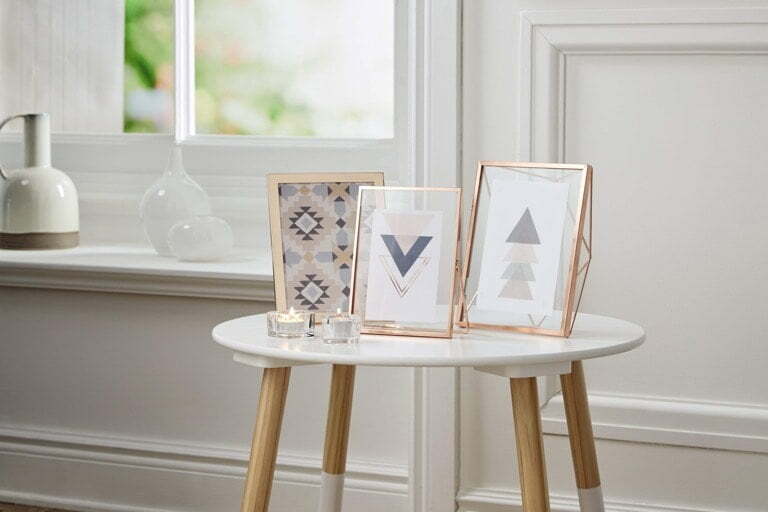 To display your pictures, the Cosy Home Photo Frames are modern with a geometric style. They come in rose gold with silver accents which make them sleek and stylish. They actually look similar to other picture frames I’ve seen elsewhere, but these are at a bargain price of £3.99 each! To brighten up these dark evenings, the stunning new tripod lamps are perfect. They come in both floor and table versions which means you can buy them both and have them matching in a room. Not too keen on the wood? They come in grey (my favourite), white or washed wood to suit your style. The Tripod Table Lamp is £24.99 and the Tripod Floor Light is £49.99. Here we go, blankets. As you probably noticed in my Winter Hygge Essentials, I do love a good blanket! The Tonal Weave Throws are great value at £12.99 each and come in a range of colours. For snuggling up on the sofa you also need some cushions. The Cosy Cushions are available in four different colours including pink, silver, mauve and natural and only £4.99 each. New cushions are a low-cost way to add a splash of colour to your sofa! Perfect as it’s still cold, the Shaggy Rug comes in a variety of colours and are ideal for the bedroom. You won’t be disappointed stepping out of bed onto this soft rug each morning, especially as it’s only £14.99! Now, this is the part I simply say, “Aldi, take my money”. The Antique LED Lightbulbs are £4.99, yes you read that right, under a fiver! Plus they’re dimmable which make them ideal to set to the brightness you like. For a quick lounge update, the Marble Nest Tables are ideal and follow key trend styles right now. Priced at £49.99 for 2, this won’t be breaking the bank! There’s also an eye-catching Fob Wall Clock in silver or rose gold effect which will look great in a kitchen, priced at £19.99.